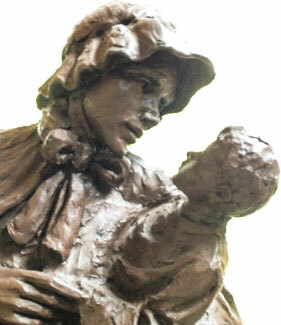 Elizabeth Ann Seton (1774-1821) was the first native-born American Saint. She was born on August 28, 1774 in New York and raised in the Anglican Church. Elizabeth married a merchant who died in 1803. They had five children. By the time of St. Elizabeth’s death in 1821, her congregation had twenty communities devoted to the care of orphans, the sick, and above all, the parochial schools. Prayer cards and booklets on the life of St. Elizabeth Ann Seton are available near her statue in the parish hospitality area. We invite you to view a DVD of Mother Seton’s life. Please come to the parish office with your request.